Plan Your Visit to Brookshire’s World of Wildlife Museum in Tyler, Tx. ~ FREE! 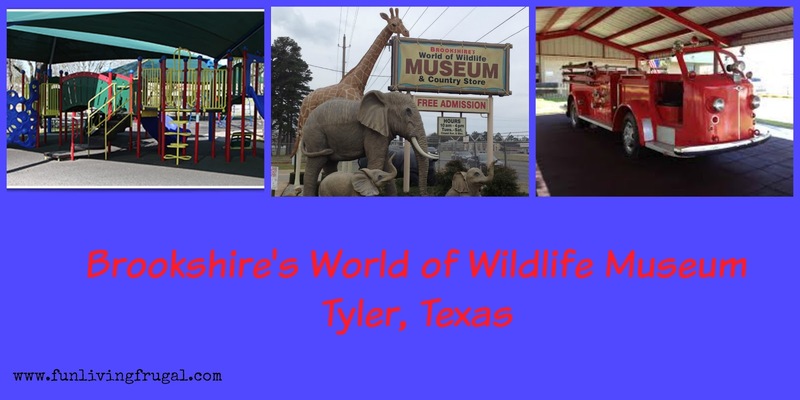 Have you visited the Brookshire’s World of Wildlife Museum in Tyler, Texas? If you haven’t then add this one to your family fun to do list. Plus, it’s FREE! The Brookshire’s World of Wildlife Museum and Country Store is one of the most popular attractions in East Texas and it’s no wonder why. Here you and your family will see more than 450 realistic wildlife dioramas. Mammals, reptiles, fowls and much more from Africa and North America are on display and your family will learn about them all with educational material provided for each one. You will have the opportunity to see wildlife depicted up close in their natural habitat to get a better understanding of how they live. When you are finished touring the museum, head over to the Brookshire’s Country Store where you will take a step back in time to a nearly life-size old fashioned grocery store. These displays are provided to help experience the grocery business of years gone by and to appreciate the convenience of our current grocery stores today. If the kids get restless just head out to the playground. There are three age appropriate playgrounds geared toward 2-5 years, 5-8 years and 8-12 years. Many areas of the playground are shaded with canopies and trees. A must for the HOT summer days in Texas. In this area the kids will also enjoy the 1952 La France Fire Truck, restored Railroad Caboose and 1936 McCormick Deering Farm Tractor. The playground area is also a picnic area as well so feel free to bring a sack lunch and enjoy the day. Another option is to visit the gift shop that provides inexpensive snacks and souvenirs. Browse the selection of goodies from the past like peanut patties and taffy. All of the attractions are FREE!! Previous postBath & Body Works $3 Wallflowers ~ Sale Ends Soon! Next post2017 Fort Worth Stock Show & Rodeo Discount Savings Guide!